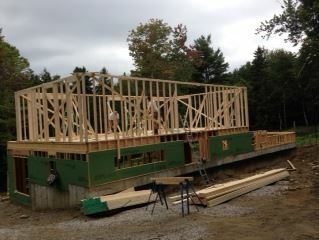 We are building a cutting-edge, super-insulated house. But the nature of its construction, at least in the area of framing, is not all that different from any other house; it just has an extra set of walls inside the exterior walls to make for a ginormous insulation cavity that is the key to its efficiency. 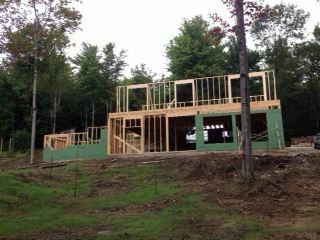 The building we have done so far has been pretty much standard, run of the mill framing. We don’t do a ton of framing, and so we get out of practice; we get rusty, and things just don’t go as smoothly as they should. This can be very frustrating and disheartening. How can we produce these energy efficient house cost effectively if we can’t keep our productivity in top form? Green building for the masses, which is a major goal of ours, requires a seriously efficient process, not just a seriously efficient product. As we have built past the first floor and reached the second floor, we have fallen into a much better grove that has allowed us to work at the rate we need to be working at to make this house affordable. It is incredibly gratifying to see the house grow out of the ground. It is a process I never tire of watching unfold.